You didn’t really know what to expect from the Toronto Maple Leafs Thursday night against the Tampa Bay Lightning. Just a few nights ago the Maple Leafs fell flat on their face and was blown out on home ice by the score of 9-2. In their previous three games they have nearly allowed six goals per game. With their opponent reeling, the Lightning didn’t do themselves any favors by playing one of their worst defensive games to date. Allowing several odd man rushes, as well as missed assignments in the defensive zone doomed Tampa Bay, who have dropped two in a row and have allowed nine goals in that span. Despite their recent struggles, Toronto remains a very dangerous offensive team. Speed wise, only a handful of teams can match the Maple Leafs and after being burnt early on by that speed Tampa Bay did not adjust and continued to get caught up ice. Alex Killorn was unable to get a stick on David Clarkson on his opening goal nor was he able to block the shot, proving to be nothing more than a double screen on Ben Bishop (Radko Gudas was conveniently placed right in front of his goaltender as well). The goal was directly after the Maple Leafs failed to convert on an early 3-on-1 opportunity. 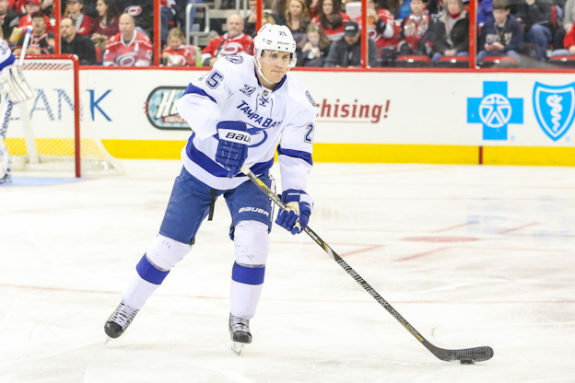 After tying the game late in the first, the Lightning was not able to build on the goal as Richard Panik scored on his former team after another defensive miscue. After batting down a backhanded clearing attempt over the middle by Matthew Carle, Panik made a great move to beat Bishop. James Van Reimsdyk showed his versatility as an offensive threat, beating the Lightning with his speed and then later by putting in a rebound after being left all alone in front of the net while on the power play. The fact that this is only the second multi-game losing streak the Lightning have endure this season speaks volumes at the start they have had, and while more streaks not in their favor is expected the way they have gone about this current one is a troubling one to watch.